The ambitious Clinton L. Williams, Potentate of the ACCA Temple, Nobles of the Mystic Shrine, conceived of the plans for a huge entertainment venue that would dominate downtown Richmond’s nightlife and become a new meeting place for his growing fraternal order in 1918. 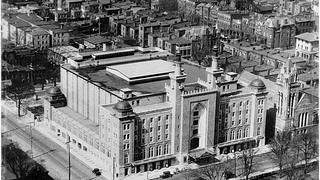 After years of hard work, the Mosque Theater (now known as Altria Theater) opened with a performance from famed opera singer Madame Ernestine Schumann-Heink on October 28, 1927. The Mosque was designed by architects Marcellus Wright, Sr., Charles M. Robinson, and Charles Custer Robinson and originally featured a 4,600-seat theater, four lounges, six lobbies, 18 dressing rooms, 42 hotel rooms, offices, a restaurant, a gymnasium, locker rooms, a swimming pool, and even a three-lane bowling alley. When it was sold to the city of Richmond in 1940, the opulent theater lived up to its original owner’s intentions, hosting legendary performances from the likes of Elvis, Frank Sinatra, the Supremes, and Jimi Hendrix. Historic photo of Altria Theater's exterior facade. The city restored many of Altria Theater’s architectural features between 1994 and 1995, but it was still in need of critical updates by 2002 when Wilson Butler Architects created a citywide master arts plan to restore many of Richmond’s historic theaters. Carpenter Theatre (made up of the Libby S. Gottwald Playhouse, Rhythm Hall, and Showcase Gallery) along with Altria Theater, are part of the Richmond CenterStage Complex, an interactive performing arts space. The restorations to Altria Theater were intended to help the building anchor the local community at Virginia Commonwealth University, as well as other arts organizations, businesses, and residential areas, to Richmond’s downtown area. 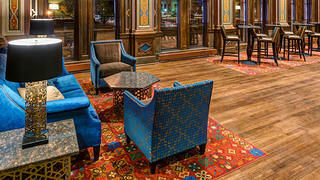 The lounge after the theater's restoration. 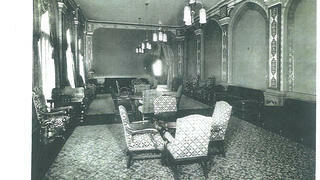 Historic photo of the original lounge. 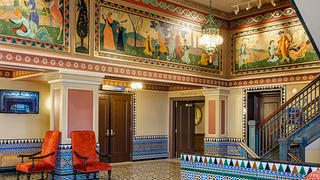 Herndon Lobby after the restoration. 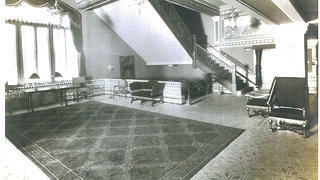 The original lobby of the Mosque Theater. 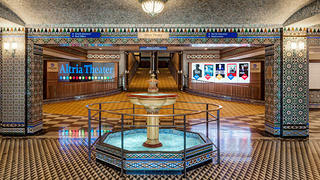 The updated fountain in the theater's lobby. 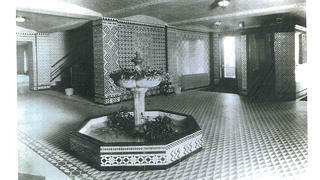 Historic photo of the original fountain. The Secretary of the Interior Standards for Treatment of Historic Properties worked closely with Wilson Butler Architects on design decisions, which were approved or rejected depending on whether they compromised the building’s original character. 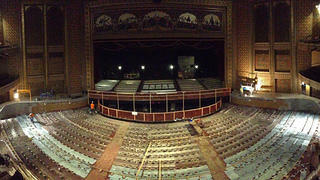 Evergreene Architectural Arts, a group focused on restoring historic properties, was also vital to restoring Altria Theater to its former glory. Evergreene restored original details, including decorative designs and woodworking that had been covered with several layers of paint, based on extensive research into historic photos and documentation of the building. 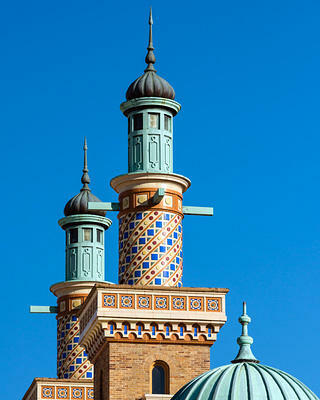 The theater’s Moorish Revival-style exterior minarets, paintings, and decorative tile work were all authentically restored. The brick on the building’s exterior facade was relatively unique and difficult to find, so the architectural team moved brick from masked parts of the building to the south and east facade, which are the most visible. Interior of the theater during the restoration project. But most updates to the building were infrastructural and included additional amenities like bars and restrooms, technological work inside the theater, and creating a better viewing experience for audiences. These less visible, though arguably more important, changes were also some of the most challenging for Wilson Butler to accommodate. The team, however, found creative solutions to overcome these challenges. For example, to update sightlines for patrons, Wilson Butler re-poured the concrete floor of the theater and changed its pitch. They also respaced theater seats to improve visibility and comfort. According to Stiling, “bringing Altria Theater into the modern day was the most significant change to come to the building. It was the technological advancements and the enhancements for patron experiences that were critical to [the building’s success].” And, ultimately just as important for making it a center of the community once more. 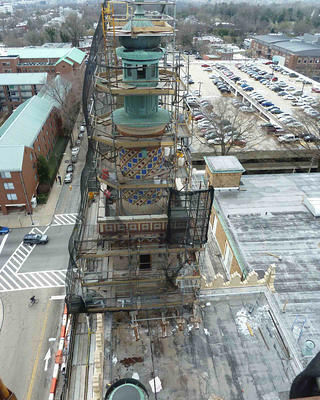 One of the minarets during restoration work. Minarets after the restoration project was complete.